Our homeschool program has a conservative approach to positively guiding our athletes as they develop their character through athletic achievement in a fun and energetic environment. Xtreme is committed to continuous improvement and we want to ensure that each of our gymnastics classes teaches healthy, balanced living and collaborative teamwork. Check out the class schedule and sign up FREE trial class! Preschool Gymnastics: Our toddler classes are a great way for your little athlete to experience gymnastics for the first time! We work creatively to ensure each monthly lesson is fun and exciting. Our Xtreme coaches are carefully trained to make sure your kids are having a blast while they safely learn gymnastics in a developmentally appropriate environment. Girls Gymnastics: Our instructional gymnastics classes are a fun and positive environment for girls age 6 and older. We have 5 gymnastics levels to ensure that your daughter will be in a class that encourages and challenges her to grow! All students start at the beginner level and will be evaluated by coaches as they progress in skills. As soon as a student shows mastery of her current level, the coach will discuss moving up to the next level with the athlete and the parent. Competitive Teams: Our homeschool competitive teams work diligently to ensure the athletes develop positive confidence, grow their ability to receive constructive criticism, and evolve their collaborative teamwork skills. Students will compete in 3 to 6 gymnastics competitions every year. 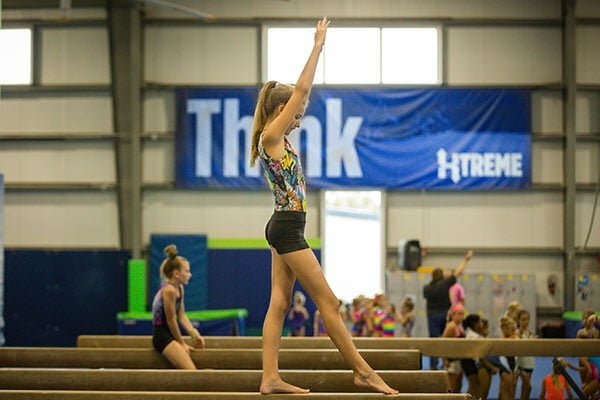 Tumbling: Whether your child is a beginner looking to perfect their handstand or an advanced athlete wanting to learn a backhandspring, Xtreme's Homeschool program offers two levels of instruction for tumblers. Trampoline: Our trampoline classes will help students develop grace and power as they perfect their form and agility on the trampoline. Athletes will progress through a strength and flexibility program as they learn the basics of the trampoline. If your student is looking for a fun and positive way to learn gymnastics sign up for a FREE trial. !